How Do I Use and Clear Outlook.com Contacts and Auto-complete Suggestions? - Ask Leo! 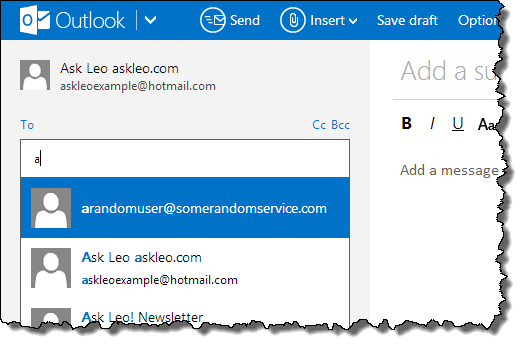 Outlook.com tries to make entering email addresses quicker, easier, and less error prone by offering a variety of suggestions when you compose email. I'll look at how those interact and how you can control some of what happens. I am finding the new Outlook.com very annoying. How do I find my list of addresses and save a new one? When forwarding, I have to click through a whole load of addresses to get to the ones I want and then, delete the ones that I did not want. It wastes a lot of time. Outlook.com is the online replacement for Hotmail. It’s unrelated to Microsoft’s Office Outlook email program. 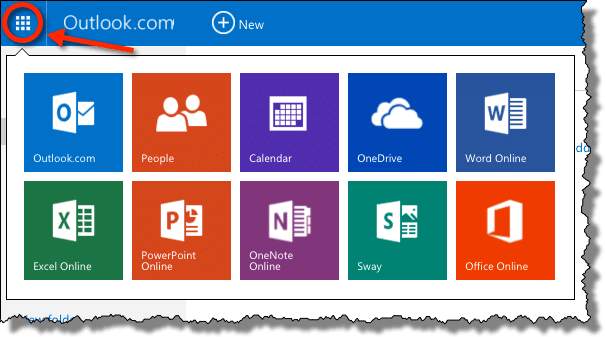 Outlook.com attempts to provide a clean, easy-to-use interface for managing not only your email, but your contacts, calendar, and (with the addition of SkyDrive) your data files as well. Unfortunately, cleanliness or simplicity only goes so far. You’re not the only one who finds the displayed contacts and email addresses confusing when you compose a new email. People is the Outlook.com term for your contacts and/or address book. Click the array of squares next to Outlook in the upper left, and the result is a menu of services to select from. Click People and your contact list (also known as your address book) appears. This is where you can create, delete, edit, and otherwise manage the entries that you want to save. I’ll simply refer to People as “contacts” throughout the rest of the article. Just click their name and their email address appears in the To, Cc, or Bcc lines of your message. Repeat this step to add your contacts, compose your subject and message, and then, click Send. When you see the email address that you want, simply click it to place it into the address field. What surprises many people is that the suggestions come from both your address book and other email addresses that you may have sent or received email from in the past. 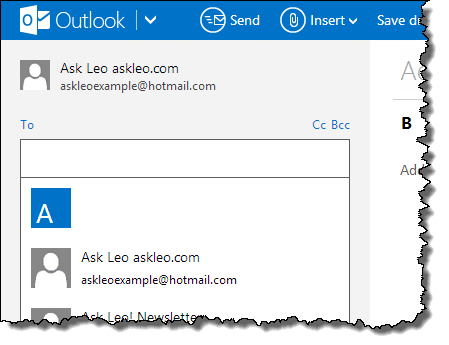 The logic is simple: clicking To, Cc, and Bcc gives you only your contacts, but if you start typing them, Outlook.com figures that perhaps you know that the email address that you’re typing isn’t in your contacts. So, Outlook.com attempts to be helpful by providing similar email addresses that you may have used in the past. Once again, this is a list of email addresses from which you can choose your intended recipient without having to type anything. Unlike normal suggestions, if you hover over entries in this list, you’ll see an X on the right side. Click that X to remove them from the Frequent contacts list. Note that this only removes them from the Frequent contacts list; it does not appear to remove them from the suggestions that appear when you type. Many people appreciate the suggestions that Outlook.com displays as you type. For these people, it’s a quick way to avoid typing (or mistyping) complete email addresses. If they type enough characters to display the correct email address, they can click it to complete the entry. Other people are confused and concerned when they see email addresses that are not part of their contacts appearing in the suggestions. The good news is that we can turn that off. Click Save. From here on out, the only suggestions that Outlook.com makes will be those email addresses found in your contacts. At this time, I’m not aware of a way to remove individual suggestions that are not in your contacts. But it appears that you can remove them all. Change the setting described above – Only suggest people in my contact list – and then change it back. That discards the entire saved list of other email addresses. If you turn it back on in this fashion, Outlook.com builds the list anew as you move forward sending and receiving email. And of course, if you see suggestions from your contacts that you don’t like, simply go into your contacts list (via that People selection that we started with) and delete them from your contacts. One of the risks of writing about Outlook.com or Hotmail… or let’s face it, anything on the internet … is that things change. Nowhere is that more common than with online email offerings. So if you don’t see exactly what I’ve described here, start exploring. Rarely are features like this actually removed. The concepts that I’ve outlined should still apply. You may just need to hunt around a little for the links and interfaces to control them. If change isn’t your thing, then you should probably avoid online email services, like Outlook.com, Gmail, Yahoo, and others completely. The one thing that I can guarantee is that things will change if not sooner, then later. You can insulate yourself to some degree by using a desktop email program whose updates and changes you can control. 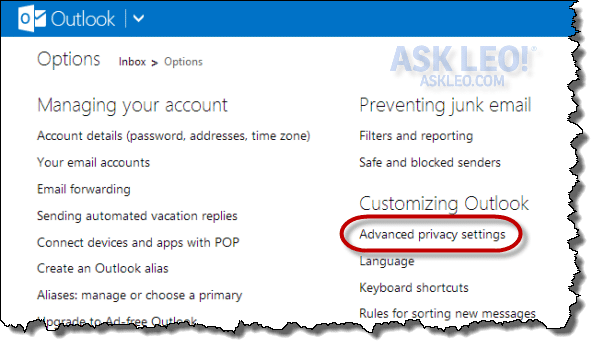 « Previous post: How do I change my Hotmail or Outlook.com password? I use Microsoft Outlook for my email and I could not find the gear icon for making changes. I too am frustrated because when I had Outlook Express 6 with Windows XP, I could put all of my contacts in separate groups and email them at a touch of a button. With this Microsoft Outlook, I cannot do that. Also, my contacts do not appear on the People app. Maybe they should not be there with Microsoft Outlook. I jumped from Windows XP to Windows 8 and maybe I should not and gone with Windows 7 instead. I am still getting used to Windows 8 and it has been a lot of trial and error. Do you mean Outlook or Outlook.com? The gear icon for making changes, relates to the web based outlook.com user interface, not the Microsoft Outlook email program. What version of Microsoft Outlook are you using (if you are)? In the 2010 version you can make Contact Groups just like Outlook Express. Go to Contacts and on the Home tab click New Contact Group. Enter a name for your group, then click Add Members. There are three options – From Outlook Contacts, From Address Book, New E-Mail Contact. Click Save & Close. You can also make a Contact Group in the web based outlook.com via your contacts page (called People in this new version). Access by clicking the drop-down arrow next to Outlook on the email page. Then select New Group from the drop-down menu next to New. Enter a Group name then click in the Add Member field to enter the email addresses for the names in the group. Click Save. Thank you for this information. I wondered how I could add/remove e-mail addresses, but hadn’t really been interested enough to look it up. This article gave me just what I needed. Have him install Classic Shell. I’ll bet he likes it a LOT more after that. This is helpful. I’m also wanting to remove the auto-complete suggestions from the search box within outlook.com (when I’m searching for email form a particular address). Is there any way to do that? I’m stuck…. I have the same question as Arthur; how to clear/delete the auto-complete suggestion from the “Search email” box. I know how to delete the auto-complete list when creating new messages, but this one seems to be impossible to clear. Your help you be appreciated! I am looking for how to remove frequent contact in outlook. I need sme help.when i fwd mail on outlook .com .i dont want to have series of fwd msg ..original msg stuff.how to delete them .it seems i cannt edit my fwd mail. You don’t have to delete all of your autocomplete list and rebuild it. 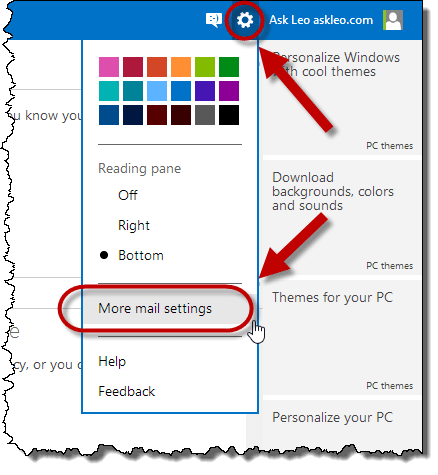 You can get rid of individual email addresses in the Windows 8 Mail Client. I have no way to delete them. I made all the changes I red in this article but nothing works. I put in 2 or 3 letters and I’m getting email suggestions from way back, all those email are deleted long ago. Removing frequent contacts in Outlook web works great, but how about the Outlook.com Android app? Many of those frequent contacts come from a long deleted Yahoo account? How can frequent contacts be deleted from this app? There appears to be a setting to do this, but it does not get rid of old contacts. Thanks. That is the URL + page header, then you say – I don’t know how to, other than turn the feature off. False advertising! Sorry, but sometimes knowing that there may not be a way is very valuable to people. It allows them to stop looking for an answer that may not exist. Thankyou very helpful and comprehensive article. I was able to synch my outlook.com contacts list to the auto complete suggestions then turn suggestions back on to start afresh – hadn’t thought to look for it in a privacy setting. In looking for an answer I found using outlook was not specific enough for keyword searching while outlook.com presented a less but still very mixed up list which lead me here. How do I group contacts together into selected catagories so that I can easily email for instance my “yoga” contacts or “work” contacts? I see ‘groups’ listed in People but can’t figure out how to actually form a group of selected contacts. Thanks. I used to like using hotmail (or “outlook”), (I don’t really know the difference), but now there are either annoying ads that block the text of the messages or there is an annoying search pane that doesn’t seem to close. Hard to read my messages now. I have the same question as Bob & Arthur; how to clear/delete the auto-complete suggestion from the “Search email” box. No matter what I do I cant get rid of the record of email addresses in the “search email” box of emails I have sent in the past even though the actual sent emails are long ago deleted. I know how to delete the auto-complete list when creating new messages, but this one seems to be impossible to clear. Your help you be appreciated! We just created a new email address within the same Outlook Win 7 program we have been using. For some reason this email is automatically deleting emails I guess it views as junk. How can I stop this?! I have changed the auto-archive button to DO NO ARCHIVE on it and it is still deleting emails before I can even look at them. A line comes up through the topic and then it’s gone. Help please!! Hi – this was very interesting. 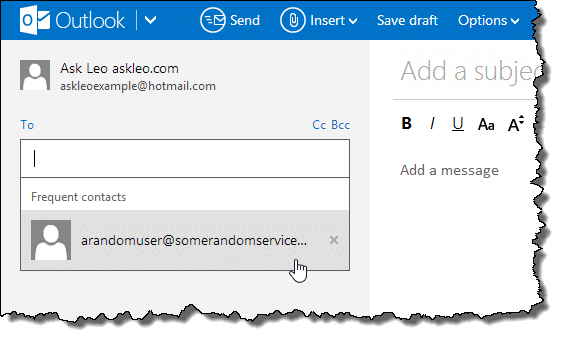 It is related to my issue but not quite the same – what I want to know is whether there is any way to cause addresses you’ve used in outlook.com that were not in your contacts, to get added to contacts, either automatically or via a manual process that is less than explicitly going and adding them as a contact ? There does not seem to be. Related to the issues discussed, I have Office 365. In Microsoft Outlook I have an email address listed in People that is out of date and I want to replace. Every time I attempt to edit it out (whether I click into the edit+dots on the right or not) after I delete the old email address, type in the new one and save, the old address appears unedited in the People listing. However, my attempted change in People, resulted in the program making my edited change of the same listing in the separate old fashioned Contact list, so the new address appears there instead. I am at a loss with this and what the difference in in the two lists is all about. I would like to stress the importance of the “Caveat: Everything changes”-section. That heads-up after a close reading of the article got me exactly where I needed to be quickly, even though there were changes in details over time. It is so rare to find help of this caliber. You have a new fan. Thanks so much – I persevered and found out how to stop the annoying autocomplete of email addresses. It hadn’t occurred to me to look in Advanced Privacy Settings. You’ve made an annoyed lady very happy! Dear Leo. You’re wrong right at the start of the article and it took me forever – OK, it shouldn’t have done! – to find the right answer, so I thought I’d put it here to save others’ frustration. I don’t know where you got the little down-pointing arrow in Hotmail from, it doesn’t exist. You have to click on the ‘square of squares’ in the top left-hand corner of the screen. It’s a three-by-three square made up of other little squares. THEN you get ‘People’ coming up and the rest of your article works. I’d love to know HOW you got that little arrowhead to appear. I couldn’t find a way of making it happen nohow nowhere. Different version of the system in a different country? The article isn’t really wrong, or at least it wasn’t wrong when it is written. Microsoft has changed the interface since then. Thanks for pointing it out. There are thousands of articles Ask Leo! and with programs and websites constantly changing, comments like yours help keep things up to date. Wow. No need to get upset, but … did you even read the entire article and see the section labelled “Caveat: Everything changes“???? Guess what – things changed since I originally wrote the article. I’ve updated that initial image to reflect the current state of affairs. But a note to all who follow: things can change!!! Particularly when it comes to Microsoft and Outlook.com. Rather than getting upset or confused, take a moment to explore the user interface a little. Chances are the changes aren’t as dramatic as you might think, and quite possibly very similar to what you were expecting. A friend of mine as this e-mail application and is trying to build a folder inside of his People box so he can send mail to a whole group at one time. How does he add the new folder within his Contacts? You can just open a new email account and close the old one. Before closing it, I’d change the password and recovery information. In fact, if you simply change the password and recovery information, your ex would no longer have access to it. It looks like Outlook.com has changed the layout of its settings page again (Dec ’16). I can’t seem to find the Auto-Complete radio button anywhere. When I go into privacy settings it takes me to a whole new tab (to the parent microsoft account). I’m pretty sure I have turned this off in the past but for some reason it is on again. Any idea where to currently find the Auto-Complete option? I have mispelled my clients name on his email address that pops up every time in enter his email address. I would like to correct his name. eg John Dope johndoe@popup.com. How do I change his name from Dope to Doe? How do I remove an address from the list of suggested addresses? For some odd reason an address has entered my list. An address that is very similar to the one I should use. For clarity: the ‘wrong’ address is not one of my contacts and should not be in the list. So I can’t remove it from the list of contacts (since it’s not in there). In most, but not all cases, scrolling down the list to the unwanted item and hitting the delete key will remove the item. In my case, I want to enable auto-suggest of contacts but I don’t know. I see auto-suggest of frequent or recently used contacts but I want auto-suggest from my contact list – e.g. when I type “Dav” I want see any names or email ids that start with “Dav”. I want this feature but I don’t even know how to enable it anywhere. how can i send up to 50 messages at once with the bcc tab in the microsoft outlook.com beta 2018 i tried doing earlier but it keeps saying search no recognise couldn’t find people can some pls help thanks. Email service providers limit the number of email addresses you can send at a time to prevent spam. To send more, you can subscribe to a newsletter service like MailChimp or Aweber. Leo uses Aweber, but for small mailing lists and low volume MailChimp is free. I suppose what bothers me most is that all the other emails add an addressee to your contacts list automatically. Here in HOTMAIL, I have to add each one by one, with a minimum of 3 steps each time – first name, last name, email. What a waste of time. Why doesn’t HOTMAIL still work as it used to regarding the contacts list? What are people with hundreds of contacts doing? I hate the one at a time, but at least in 5 more days at 20 a day, I’ll be finished. As of 9/2018; how do I get an email address to show up in my auto complete list. Some do/some don’t. I know “everything changes”. How does it work today?